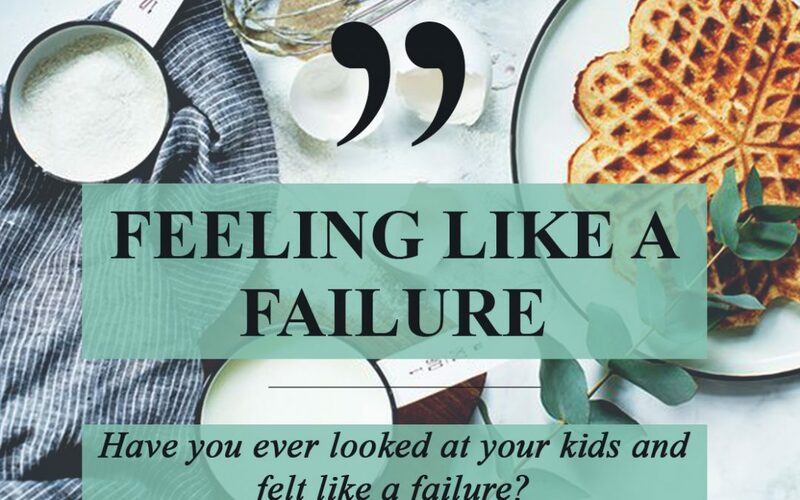 Have you ever looked at your kids and felt like a failure? Well I have. Just last week on vacation, I had this feeling about the third day into our vacation of what didn’t I do. I found myself in the same spot every morning of the kitchen cooking for everyone and then turning around washing the dishes that everybody else messed up. I paused and thought how I have failed them after observing their lackadaisical, disinterested attitude about what I was doing. It puzzled me so much so that I stood there wondering what in the world do we have here. Then it hit me like a ton of bricks this is what you have trained them to expect. You get up every morning and put yourself behind that hot stove on vacation because you choose to. After hearing that it didn’t make me feel any better. LOL! I’m thinking can you offer a hand without me asking for once in your life?? Now, I had no pushback when I asked them but I wanted them to do it on their own. They would jump right in and help after I petitioned them. Hear me, I have awesome kids and anyone would love to have them and I know that. When they were young they would go over others’ house and clean and their friends moms would tell me all about it. However, I love sharing my thoughts and feelings because I know it can help others. Most people in my position aren’t willing to share such things because of the fear of judgment. Well, if you know me you would know I really don’t care to give my brain space to others thoughts or judgments. I have enough to think about. I had to comprehend that my feelings had nothing to do with my children but it had everything to do with my expectations. Are your relationships built on the expectations that you have communicated, or the assumptions that you think to yourself? So Holy Spirit really started to speak to me. He said, “You cannot have expectations of someone, and you haven’t told them what you expect”. Wooooo! lol I am thinking, “Why are you jumping me? Get them!” Lol They are the ones sitting down, and I’m busy in the kitchen serving like Martha. Have you ever had expectations of someone, and they disappointed you? Now, have you told them what you expected? This blog is not about my kids so, don’t be thrown off and not hear what you need to hear for your life and relationships. This could be about you and a friend, you and your husband, or you and whomever. Examine your relationships right now and be honest. You have no right to be mad or upset at someone when you have not expressed what you need from them. Unfortunately God didn’t make everyone a mind reader so that means we must talk to build a list of expectations within relationships. Many relationships go awry due to assumptions that we have without the communication. Pastor Mike says all of the time, “Assumption is the lowest form of knowledge.” No relationship should be built on assumptions. It is vital that you establish your request beforehand so you can know what to expect in the end. Wheewwww!! What a mouthful and eyeful for me. Your words are so timely and ring true for so many of us moms as we are the nurturers by nature. It has been instilled in us almost from birth the need to be nice, to be helpful, that this is ‘our’ role to be the servant if you will. You are right, without setting proper expectations in our relationships, we have no right to expect any less than what we receive. Be blessed Dr. Dee Dee. Love you much! I feel like I fail my children because I wasn’t more involved with school stuff like I should have been. As usual AMAZING and right on time! I receive this! I receive!!! A good word!!! I needed this. Thank you!! Wow! This is a blessing! I was dealing with something similar this weekend. Time to communicate expectations! Thank you for your transparency! You are always so transparent and down to earth!!!!!! Let me say what blesses my life,is to see Gods girl so touchable and free!!! That’s why your life can touch the world simply Amazing! I really needed this today! Thank you De. DeeDee! Amen,thank you so much for always Blessing me Dr. DeeDee! Another great word Dr. Deedee!!!! I’m so blessed to be able to hear from you in this way. I was just ministering to my two girls (20 & 27) on yesterday about their relationship with each other and how they need to have a conversation (just the 2 of them) where they could lay out their expectations of each other without involving others or making assumptions about each other. I am so happy that you wrote this post. Just to clarify, I love my girls and my son (26) very much and believe that they are beautiful people, but they seem to be better, it appears,at looking out for the emotional well-being of their friends than each other. I often wonder where I might have failed in teaching and modeling for them how to have positive relationships with each other. Thank you for being my Proverbs 31 Coach! Received this message right on time. Thank you Dr. Dee Dee. Now i will humbly go and explain my expectations instead of first getting offended. Dr. DeeDee, this came in right on time . I thank God for you and how you give of yourself to bless so many people. Thank you again for an on time word Dr. DeeDee. The saying “Treat others as you would want to be treated” the problem we think people should reciprocate that same gesture or feeling without even communicating effectively thats what we want. In some arenas I can speak up “no problem”. More intimate settings, its harder I must do better in letting my requests be known. I am currently enjoying your new book ‘Focus’. I’m taking lots of notes, thank you again for answering the assignment that God has given you!! I always look forward to Monday’s email. Some of your writings allows me to see myself and say “she’s right, where did I miss it.” Then I keep reading, and stop crying because I see a plan. Better yet, God’s PLAN that pick me up 🙂 ! I don’t go to church that much but hear a sermon every time I read your emails. Also, thank you for being so open and honest with your life that’s why real change is taking place in mine. To God be the GLORY! Wow. This was confirmation from Holy Spirit for me. Selah. I think this strikes a common cord with everyone. Who has not felt disappointment when our ” unexpressed ” needs, wants, or desires have not been met ? I know I have !!! What a gentle reminder to this notion that we cannot expect what we have not requested or required. Once again, thanks Dr. Dee Dee for your transparency. So much appreciated !! Great lesson woman of God.Am enlightened.Thank you. An awesome word that spoke volumes to my heart Dr. Dee Dee! Made me realize that I don’t have a failure problem, I have a communication problem. It’s time for me to share with close family and friends what “I expect of them from the onset”! Continue to be blessed Might Woman of God! Ouch! Thank you Holy Spirit for speaking directly to me through your vessel Dr. Dee Dee Freeman. Point well taken. In any relationship never assume anything, but communicate about everything. Yessss we needed this Blog today. What a good example of expectations. What happens when you do tell them what you expect and they still disappoint you?… Where do you go from there?… Is that still failure?… Your blogs always make me think about my life and rearrange my life style and thinking.. You are so real! A much needed word that I will definitely apply today!! Thank you. Wow! What an eye opener for meeee! I have to do my part first. And stop expecting without the proper communication. Love you Dr. Dee Dee! Dr. DeeDee thank you sooooo much for sharing! Thanks Dr. Dee Dee. Although I have been aware of this principle it is a great reminder. I still sometimes have to catch these thoughts that come in my mind and cast them out. When it comes to my husband, I have even had Holy Spirit remind me that I am his help meet, when I have had thoughts of “Why do I always…” Communication is definitely necessary. I have noticed that during times that we are communicating more frequently, with purpose and unity, there is such peace and rest. Awesome!!! Praise God for your transparency. I had to recognize my own unrealistic expectations of others based upon my desire & not my direction. The Holy Spirit revealed it to me plain as day when I found myself frustrated about not getting the response I thought I should’ve received. You are so right, communication is key! Thank you, Dr. Dee Dee. Why you all up in my business, I was having the exact same thoughts about that husband of mine,why in the world he does not come home and lets just hang out and enjoy each others company. My daughter do I have to tell you to dust vacuum the floors,instinctively you should know just like I look down you should too.But the message is so clear,tell people what you want when you want it done. Thanks for reminding us of this life lesson. I learned this and taught it to my adult children some time ago. Now I have one that shows up on family vacations and says “don’t expect me to do anything, I’m here to relax.” Lol! I’m glad you enjoyed some time away. Love you! Hello Dr. Dee Dee , I love the saying by your husband. Communication is so important and it goes without saying, getting an understanding (knowledge) is equally important. My daughter in law and I got off to a bad start in relationship due to ineffective communication. I did not know her past and she knew nothing about mine. She had put expectations on me and I was not aware of her sensitivity factors. For example, If someone has past insecurities that have not healed, they can’t assume you are aware. I expect a lot from myself, not others. Ooops, maybe my husband. Yes, this one spoke to me on a higher level. Thank you! Wow!! After reading that although Ive heard so many times, its like a revelation. That really put things in the forefront. Thank you Dr. Dee Dee. Dr. DeeDee this is a Awesome blog! my husband tells me all the time “I’m no mind reader. It’s so bad with me I won’t say anything I will just do it, and at the end I’m the one tired and mad! lol. I will do better! love ya Dr. DeeDee. Wowwwww! I have entertained this thoughts on many occasions about my kids. Like you, I think I have wonderful young adults, and others often comment about them. However, I feel like I failed in areas. But thanksGod I got it. Today’s blog really ministered to me. Thanks Dr Dee Dee for sharing your heart. I thank God for you. I loved reading this. You are so right about individuals making assunptions. This certainly,impacts a lot of our relationships. I have learned to tell people my expectations. I think this evolved for me from spending years in the teaching profession. Oh my my my! Thank you for that wisdom. Thank you for sharing. This has blessed me tremendously. Wow! Amen! Amen! Amen! Pastor Dee Dee, that was yet another confirmation for me as to what God wants to do in my life as well as what I need to change about me! 🙌🏾🙌🏾🙌🏾🤗🤗👏🏽👏🏽 Thank you Holy Spirit!!! Dr. Dee Dee you are awesome for opening up to us and sharing your heart and observation… thank you for your transparency. Communication is definitely the key. You’re a mom and you’ll always be their mom, but now that everyone is married with their own households, your nurturing now shifts to mentoring women as ‘wives.’ If your husband was lifting something heavy in the house he wouldn’t have to ask another man to help him… the other guy would recognize the need and move in his direction to help. Share with your children how as wives we help each other to carry the load so we can all fellowship together, get the job done quicker, and rest at the same time enjoying the fruit of our labor. You’ve gotten them this far SUCCESSFULLY… now NURTURE them as wise women and Godly wives! Love you much! Thank you, thank you, and thank you again! I have totally been one of those people who failed in the area of successfully communicating what my wants and needs were in my relationships. Then I would get upset with the other person because I did not get what I wanted and/or needed, not realizing it was my fault, as you already stated God has not given us the ability to read minds, and because I failed to communicate my expectations and needs to others. Thank God for age and wisdom…now I do communicate my expectations, wants and needs in situations and in relationships. I also follow my gut feelings too and when I don’t I always pay for it later. I am so grateful for your reminder of how much responsibility I have in ensuring I am treated the way I expect to be treated in situations. I get the assistance and care I need and/or require from those I love and serve. Also, I provide what is needed to the people God has called me to love and serve. Again, I thank you. Great Word! Place no expectations on others and you will not be disappointed. I appreciate your openness to express concerns that we all have but not quite sure how to deal with them or feel like you, as the first lady, does not experience what everyone else experiences. I thank you for being honest, promoting a self-checks and a sense of no-fear due to what some may say are vulnerabilities. Thanks!!! Awesome word, as always, Dr. Dee Dee! Thank you so much Dr. Dee Dee for sharing this. Your transparency is utterly amazing. I grow and learn from you each and every time you speak. My prayer is to always be humble as yourself, clearly hear from Holy Spirit and diligently walk in obedience unto God. So Blessed & Grateful to have you in my life. I can so relate to this and like you the finger pointed to me. I did everything for them down to buying gifts for their for friends and family. They are all adults and each year when holidays come around we are the last to get anything and like you I find myself wondering what did I do wrong. They were around when I shopped and made certain everyone had a gift so why didn’t they catch on. I know they love us but like you if a hint is given they’ll apologize and we know they genuinely mean. Awesome! Yes! And Yes! Again, I often have thought who are these people that say they are my children lol. I hear what the lesson in this. My expectations are not known in most of my relationships, and I see how that has caused a lot of mishaps in them all. Thank you for sharing and opening my eyes in this area. Thank you Dr. DeeDee this words transcends motherhood and crosses to all relationships. Relationships are built on expectations where we don’t communicate the expectation most of the time. The Lord flipped this on me and asked, “What expectations do others have of you; that you haven’t agreed to or accepted and not communicated?” Walking around frustrated weighed down and heavy because of it. Awesome word that confirms what I have been experiencing! Comunication is everything! Thank you for sharing! Dr. DeeDee, my words may not have come out right tonight because i was excited being so close to you and Pastor Mike.What I really wanted you to know was that I have been moving mountens in my life this year.I have been taking authority over situations that have hindered me in the past.I have boldly set things in order and finally taken the advice that you gave me years ago. I am now a freewoman. The person that I met was me.And I love the person that i am. I have taken back my life. No longer am I just settling for any old kind of treatment like I once did. I am a new woman and getting better everyday,stronger, happier,bolder and just plain better all around. I am so looking foreword to my future. i know that it will be better then my former. thank you for speaking into my life praying for me and believing in me. i know that I am not a failure. Time to re-exam myself yet again. Thank you always pushing others to grow. I know I am guilty of having assumptions that I haven’t communicated. Somehow we think others should just know. Sometimes I feel like a failure because when I give, I give all of me. When I say all of me, I will go above and beyond the call of duty. In doing so, I was hurt and I’m one for talking about it and moving on. How do you deal w/the hurt whn the person won’t own up to it and doesn’t want to talk about the issue? My husband and I decided about a year ago to do just what you have expressed in this blog and it has helped our marriage tremendously! We used to assume that the other “knew” what was expected and there was always disappointment later. Now we discuss our expectations regularly during our family meetings. Thank you for confirming that we are on the right path. Great blog. This really helped me because I had the same feeling about wanting them to help without me asking. #UnrealisticExpectations I needed this!!! OMGoodness. I often have the same conversation with myself and get frustrated with everyone else. I even get frustrated with my husband for not having intervened on my behalf. Even though I never shared my expectations with him either. Only after I get an attitude with everyone while we’re on vacation, that people notice and ask what’s wrong, etc.etc. then I get help. Honestly that’s exhausting, when I could just be mature enough to express my expectations from the onset. Thanks so much for sharing. LHM! I should have read this one BEFORE the family reunion one where I replied about my husband forgetting my birthday!!! This is a perfect example of a saying I used to have and it would work perfectly here: “They/I can’t fix it if they/I don’t know it’s broken”. I got the message in reverse, but trust, I got the message! Thank you, Dr. DeeDee! This is so true we give and do so much without asking; however every once and awhile I want, NO I need help. Last child home and hubby says we can’t help you because we can to it (clean,wash and etc) so we may as well not try. I must say this is not true!! Deedee you say it! !